The Executive secretary of CS-SUNN, Mrs Beatrice Eluaka has raised concern over the alarming trend in Nigeria’s malnutrition burden,which has impeded the nation’s economic development. She made the disclosure at a media round table on the Partnership for improving Nigeria Nutrition Systems(PINNS)in Abuja . She noted that, stunting is currently an indicator for measuring country’s development index. The Executive secretary is calling on federal and state government to scale up and smoothen operations in the provision of nutrition related and health interventions in the country. According to her, the 2017 Multiple Indicator Cluster Survey puts stunting rate at 43.6% as against 32.9% in 2015 . 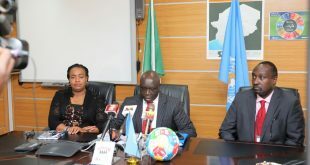 The Executive secretary of CSUNN hinted that the UNICEF conceptual framework states that;inadequate dietary intake, inadequate access to good nutrition ,inadequate care for children and women,are the underlying causes that mitigate against nutrition. She stated that in order to tackle the issue of malnutrition, the government need to address the immediate causes and the underlying factors. Mrs Eluaka also urged the media to step up reportage of nutrition issues to attract policy makers and concerned stakeholders to take the right steps that will curb malnutrition in the country. Speaking further, she called for an effective coordination of nutrition activities, both at the national and sub national levels. While speaking,the project manager of CSUNN,Mr Sunday Okoronkwo emphasized the need for increased funding for nutrition Intervention at both the federal and state level. He disclosed that the PINNS project is meant to strengthen nutrition governance in the country. While stating that the lack of transparency of government to fund allocations in some states have hampered the growth of nutrition interventions. “The decision Making process as it relates to managing nutrition in some states is somehow limited.The states have to go through rigorous process before getting money from government”.